Ultrasonic SL1438B is a battery powered ultrasonic flow meters and features micro-power consumption and super low start-up flow rate. The high-performance long life battery, the micro-power consumption circuits and the high-efficiency electroacoustic converter makes it possible to measure out doors where no power supply is available. SL1438B Ultrasonic Flow Meters It is suitable for a single liquid medium, without much impurity, particles, suspended solids or air bubbles, and for full pipe f low measurement. SL1438B Ultrasonic Flowmeters can be widely used and is suitable for any acoustic conductive fluids measurement. Data storage vi a EEPROM, can record the total i zed flow data of the previous 64 working days, previous 64 working months and the previous 5 working years; data is permanently saved after powering off . Power supply : internal battery（3. 6 v/ 19. 8 Ah ）can continuously work 8 to 10 years, or 10 ~ 36 VCD external power supply can be used to power it . Display : 8 -digit LCD display for prompting and display instantaneous flow, total flow, total operation time, date etc. Storage : Data storage via EEPROM, can record the total flow data and the data can be permanently saved after powering off. 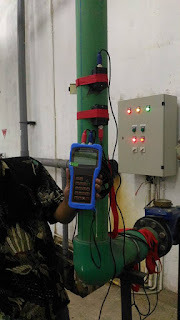 Install the SL1438B ultrasonic flow meter on the horizontal and vertical pipes. Make sure the pipe is full of liquid. Before installing the SL1438B ultrasonic flow meter, clean the pipe surface. Straight pipe section of the same diameter D as the meter, having length of 10 D and 5 D shall be installed upstream and downstream of t he meter respectively. The two transducers should be mounted at the pipe' s center line on horizontal pipes. There are two kinds of SL1438B battery powered ultrasonic flow meter – compact type & remote type. Please refer to the corresponding dimension drawing before installing the meter and connect with the matched flanges.